“I am a working professional. 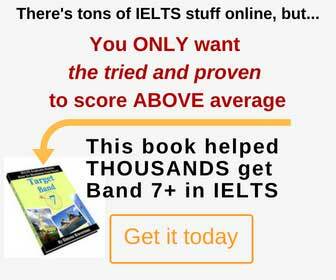 I am sure that most people such as myself are generally out of touch with their English skills (in IELTS perspective) for a long time before they decide to appear for IELTS. Therefore, I was not getting good scores when I initially started my preparation. Also, for various reasons I had to get a high score in IELTS in less than two months which added to the pressure. Try to speak in English as much as you can. Sometimes in non English speaking countries it is not always possible to find people all the time who can speak in English with you. So, do NOT just speak. Force yourself to start thinking in English as well. For instance, If I am traveling and I see an accident on a street, I would try to think in English about it in my subconscience instead of thinking in my native language. This will do good to both writing and speaking tests scores as you may get confidence in expressing yourself. Listen to English music or watch English channels on TV. It will also be good to watch debates in English over a particular topic which are usually shown on News channels. Read good English newspaper editorials and magazines (The Economist / Harvard Business Review, etc) for at least an hour daily. While reading, do NOT just read. Read critically and try to appreciate how the writer has come up with ideas so brilliantly in a short article. Read as if you can make use of the same words or ideas in your own essays. The most important thing is that after each test, give yourself ample time to analyze why you got an answer wrong. For example, in writing, it will be good to get your essay/letter evaluated and get feedback by an English teacher or a friend or anyone who you think is good in English. Then try to rephrase and analyze what would be a better way to write the same sentence or an idea. Then, re-write the essay using better words and presenting the same idea in a concise manner. In Reading, re-read the paragraph and see why you made a mistake when an answer was actually right in front of you in a paragraph. Also, be very sure of FALSE and NOT GIVEN questions. If you are getting confused in those then, take some time looking at the correct answer and paragraph again and try hard to figure out the rules of when an answer will be FALSE and when NOT GIVEN.